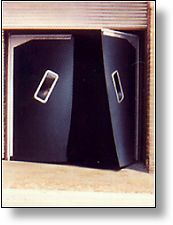 Flexible crash doors are the most practical and economical solution to heat loss and noise pollution in the workplace. With the correct panel and frame selection, flexible crash doors can provide a low maintenance, low cost, answer to reducing the waste of energy that occurs in un-enclosed areas without affecting speed of movement through these openings. Flexible doors are favoured in these environments due to their durability, ease of use, minimal maintenance and the concealed spring unit mechanism. A range of finishes to the door framework is available to suit different environments. These include powder coating, electro-zinc plating and standard paint finishes. Doors with stainless steel framework are also available. The four framework types shown below range from light to heavy duty. The Superflex, Multiflex and Interflex frames house a vertical spring unit mechanism in the top of each door tube. The Powerflex frame houses a unit in the top and the bottom of each tube. The mechanism is a double action, adjustable tension, torsioned spring unit concealed in the doorframe and is virtually maintenance free. The panels shown in the frames below are suggestions only - for the full range of panel options see the Door Panels section below. Manufactured from high quality extruded aluminium section, that has smooth lines and no projections. 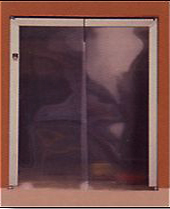 Used frequently within the food industry this is a lighter duty door than others in the range and has the panel fixings concealed within the framework. Suitable for use on internal openings with pedestrian, hand or light powered traffic on openings up to 2400mm wide x 2438mm high. openings but can be used on semi-external/external openings dependent on site conditions. They allow access by pedestrian, hand or powered traffic on openings up to 2400mm wide x 2600mm high. Manufactured from 60mm o/d heavy wall mild steel steam tube, with a horizontal gusset plate and vertical mild steel flats to hold the panel in position. Suitable for semi-external/external openings dependent on site conditions, for use by pedestrian and powered traffic. Offering a heavier duty construction than the Multiflex and Superflex these doors are suitable for use on openings up to 3000mm wide x 3350mm high. NB. On openings above 2600mm wide the triangular gusset plates will be replaced by horizontal top tubes. Manufactured from 60mm o/d heavy wall mild steel steam tube with a horizontal top tube, vertical mild steel flats and a corner gusset plate to hold the panels in position. Suitable for heavy duty external applications, with powered traffic. Powerflex doors are suitable on openings up to 4000mm wide x 4000mm high and many extras are available to increase the specification on the door framework and panels. i.e. horizontal spring unit mechanisms, dome disc protection studs, wearpads, increased overlap, larger clamping flats etc. NB. On doors below 2600mm wide the horizontal top tubes will be replaced by triangular horizontal gusset plates. Choosing the correct door panel type can extend the lifespan of your flexible crash doors. The panels shown below are available in new doors and can also be supplied as replacements for existing crash doors. All clear PVC 7mm or 10mm thick, suitable for light traffic. The most economical option available and allows maximum visibility. 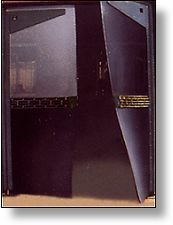 Black rubber or coloured PVC with a rectangular aluminium framed perspex vision panel. Rubber available in 8mm or l2mm. PVC available in 7mm or l0mm. Vision panels 460mm x 150mm or 610mm x 230mm. Triangular vision panels are also available. Seeflex 7mm or 10mm thick PVC with a coloured lower section welded to a clear upper section. Also available in sandwich style, i.e. coloured upper and lower sections with a clear centre section. Recommended for manual traffic. Black rubber or coloured PVC with a 281 mm diameter aluminium framed perspex vision panel. Rubber available in 8mm or 12mm. PVC available in 7mm or 10mm. 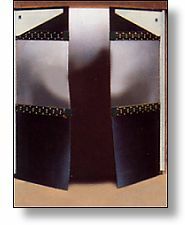 Composite clearflex. A black rubber lower section and a clear PVC upper section with the joint between the materials being effected by a ribbed rubber buffer strip. Combinations available:- 7mm PVC/8mm rubber or 10mm PVC/12mm rubber. Sandwich clearflex. Black rubber upper and lower sections with a clear PVC centre section. Joints between materials being effected with ribbed rubber buffer strips. Ideal for forklift traffic and higher doorways. Combinations available: 7mm PVC and 8mm rubber or 10mm PVC and 12mm rubber. PVC colours available: black, grey, white, blue, red. The exact structural opening width, measured at the top, middle and bottom and the exact opening height at the left, the middle and the right hand side, are required to allow for manufacturing tolerances i.e. if the opening is not square. Standard fitting arrangements allow fitting to the underside of the lintel and to the floor, please state the composition, i.e. timber, steel or concrete, that the lintel and floor are made from. Fixing plates can be supplied to enable fitting to the jambs if required, i.e. if there is no lintel or if the floor is uneven, please state the composition of the jambs. Specify what type of traffic is using the opening so that the right specification can be offered, i.e. pedestrians, hand powered trolleys, fork lift trucks, etc. Note: it is recommended that the width of the doors should be a minimum of one and a half times the width of the traffic, if this is not possible then automatic flexible doors are recommended. Location of the doors, i.e. internal or external and whether the doors are subject to wind pressures. The environment that the doors are going into, i.e. warehouse, coldroom, wash down area etc. in order that the correct specification of finish to the door framework can be offered, i.e. powder coated, electro-zinc plated etc.